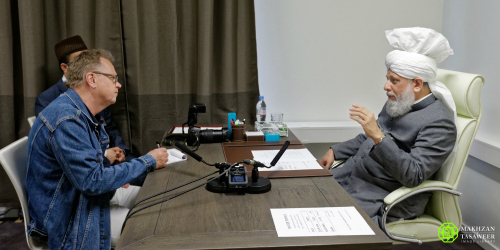 On 11 May 2016, the World Head of the Ahmadiyya Muslim Community, the Fifth Khalifa (Caliph), His Holiness, Hazrat Mirza Masroor Ahmad was interviewed by the Skansa Dagbladet newspaper at the Mahmood Mosque in Malmo, Sweden. Asked if he could travel to Pakistan, His Holiness said that it would not be possible for him to conduct his duties in Pakistan because Ahmadi Muslims have been declared non-Muslim in Pakistan and are not permitted to practice their faith with any freedom. Share the post "“Everyone has the right to propagate their faith but only through peaceful means” – Head of Ahmadiyya Muslim Community"